Jim Caruso’s Cast Party, Manhattan’s “extreme” open mic night, is to make its London debut at The Crazy Coqs on 6th and 7th March. Read my interview with Caruso here. 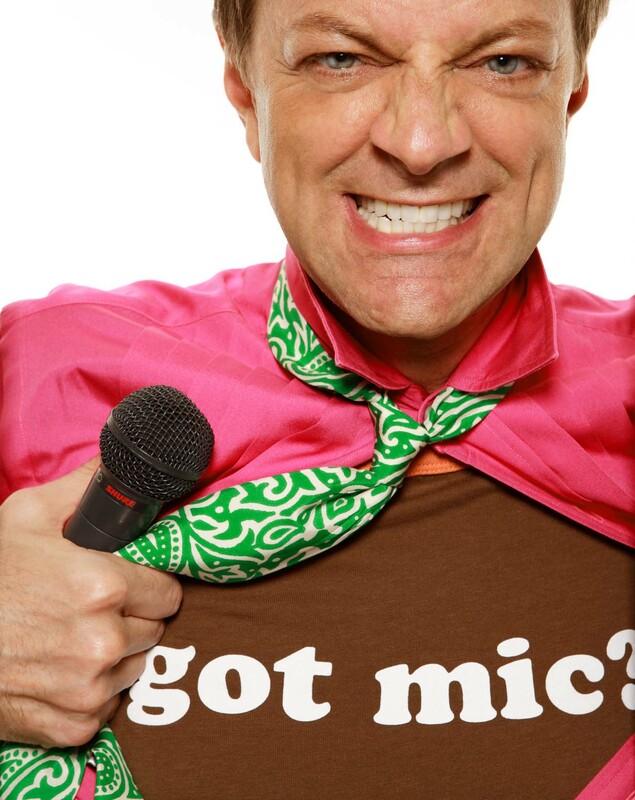 “Jim Caruso’s Cast Party“, Manhattan’s “extreme” open mic night, is coming to The Crazy Coqs this week. This will be the first UK appearance for the Manhattan mainstay, hosted by the urbane and witty Jim Caruso and fabulous musical director Billy Stritch, whom so many of us here have grown to know and love. Cast Party is a wildly popular weekly open mic night held in the legendary jazz club Birdland where Broadway artists frequently perform, given most Broadway shows are closed on Monday nights. I was fortunate enough to sing there myself as few years ago, and I can personally recommend it as a great, and unpredictable, night out. You never know what sort of acts will turn up- not just singers -jugglers and variety artists may also present something – and the likes of Liza Minnelli (with whom Caruso used to tour) and Michael Feinstein have joined them on occasion too. Marilyn Maye visited and sat at the table next to me on one of the nights I was there. A man of many talents, how do you define yourself? How do you balance your writing, PR work and performing? How did each strand come about and weave themselves into your total career? Is there a favourite part? How do I define myself? I’ve never had the good fortune to be just one thing! To be honest, as I was starting my career, I wasn’t able to make a living doing one specific job. I was fairly good at a bunch of different things, and doing all of them at the same time turned into a career. It certainly wasn’t the most efficient way to build a career, but I did what I had to do! So…I sang, danced, acted, wrote, entertained kids as a clown, did PR, booked and produced television shows…you name it, I did it! It was a tad schizophrenic, looking back! Actually, I’m glad I have had the many experiences I’ve had. It helps me see the big picture now! What was your job when you toured with Liza Minnelli? During the three years I toured with what became “Liza’s At The Palace,” I sang and danced as ¼ of The Williams Brothers to Liza’s Kay Thompson! Kay, of course, was Liza’s godmother, but was also Judy’s vocal coach, and the vocal arranger at MGM in the ‘40’s. Then she turned the nightclub world on it’s ear with her act, Kay Thompson and The Williams Brothers – singing, dancing and doing sketch comedy. Kay was someone I got to know and love during the last years of her life, so when Liza decided to celebrate her onstage, I knew all the songs, stories and most of the arrangements! I’ll tell you, we all had the time of our lives – touring the world, playing the most gorgeous theaters, singing the best songs with the most brilliant musicians – and having the opportunity to watch Liza bring audiences to their feet in every corner of the world. That the show went to Broadway and won a Tony was icing on the cake. Do you do your own shows? What sort of music do you like to sing? I’ve been performing in cabarets since the ‘80s! I had a vocal trio called Wiseguys, which played everything from down and dirty clubs to Carnegie Hall and The White House. Then, I went solo and have played most every venue I could find in the US! Billy Stritch and I are regulars at Bemelmans at The Carlyle Hotel here in NYC – and we’re looking forward to our six months there this year. I personally love singing songs by Johnny Mercer, and anything made famous by my hero, Fred Astaire! Describe Cast Party for the uninitiated – what can we expect to see in London? Cast Party is a very high-octane, extreme Open Mic Night. At Birdland in NYC very single Monday night for the past twelve years, it’s been the place for Broadway, jazz and cabaret singers to converge, meet, greet, and entertain each other. Liza, Tony Bennett, Natalie Cole, Shirley Bassey, Chita Rivera, Donny Osmond, Michael Feinstein, Carol Channing…it’s always a showbiz who’s who! Of course, there are loads of up-and-comers, too! We’ve been entertained by folk singers, pop stars, tap dancers, hoola-hoopistes! We both know a lot of brilliant folks, so we’re hoping to see and hear some of our favourite West End stars, jazzers and club singers in London! How did Cast Party come to be born? How did you persuade a venue to take it on as a regular gig? Cast Party started as a fluke. I never thought I’d host an Open Mic for a living! Is that even a job? I threw a party at a lounge here in New York, and people sang around the piano till the wee hours. The next day, the club asked if I’d do it every Monday, Broadway’s dark night. At a certain point, the place was so jammed that we decided to take the Party to Birdland, which is arguably one of the world-class music rooms. From the opening night, it was a smashing success, musically thrilling and loads of fun! The fact that Billy Stritch is the musical director helps make the Party so extreme. He’s a spectacular performer, hilarious and is certainly one of the best accompanists on the planet! With people at different levels of experience and ability, how do you settle them? To me, that’s part of the fun of Cast Party. A performance by Martin Short can be followed by a Long Island housewife singing an original song about her feet. It’s a showbiz democracy! We celebrate talent of all kinds and at all levels. They get to sing with world-class musicians, there’s no judging or booing – it’s a very positive experience for everyone! There’s always the risk someone will be really bad – what’s the worst that’s happened and how did you deal with it? I’ve had people tell me that their favourite parts of Cast Party are the brilliant performers – and also the occasional terrible performers. There are always surprises – someone called it “come-what-mayhem,” which I rather like! When and why did you start to tour it? A few years ago, Billy Stritch and I took the fun on the road, and started celebrating talent in Los Angeles, Las Vegas, Chicago, San Francisco – if there’s a stage and a piano, we’ll show up! And we’re constantly amazed and thrilled by the quality of the performers who find us! We are working our way into hosting the first Global Open Mic! Will it be the same format in London? Yes, although we have put out the word to some of our most brilliant friends! We are taking no chances! Do you have a dream London-based guest list? Of course I do! I’m keeping that list to myself…however…do you have Kate and Wills’ current phone number? 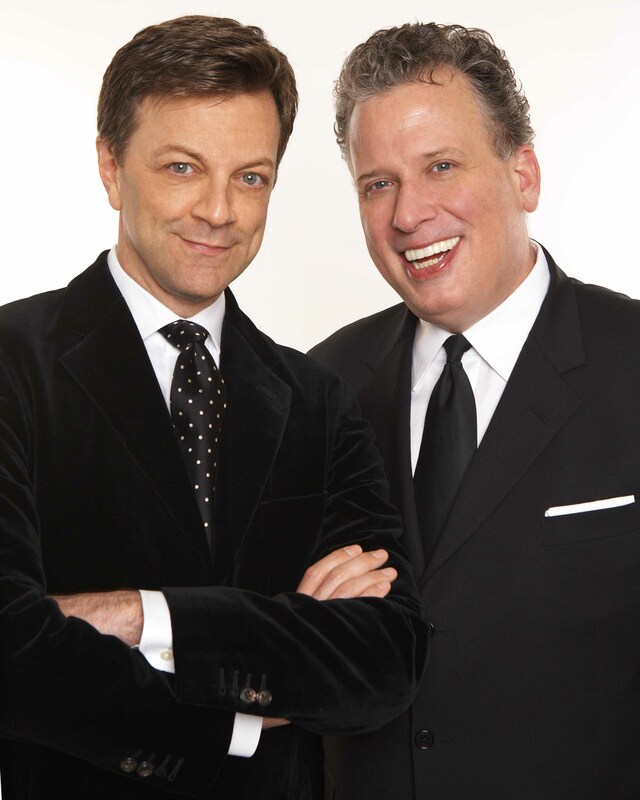 Jim Caruso and Billy Stritch ( who is also performing his own show My Musical Heroes at Crazy Coqs in the earlier part of the week) will stage the Cast Party on March 6th and 7th. This was an interesting, high energy and fun evening. It was not an open-mic in the usual sense, with people turning up bringing a song and taking a chance whether there would be a slot available to perform. As it was Cast Party’s London debut, Caruso had his own guest-list of people he either knew personally, or had been recommended to him. He did not know what they would sing, which gave it a spontaneous feel and added to the party atmosphere. There were one or two who have performed quite regularly at Crazy Coqs, such as open-mic stalwart Liza Keast and the gloriously unpredictable Mychelle Colleary. Robert Meadmore came along because he was invited, but didn’t know what to expect and brought no music with him! It didn’t stop him singing beautifully, however, and was especially safe in the capable hands of Billy Stritch. There were people whose work I had not come across before, too. These included the dynamic and very entertaining Andrew Pepper, talented drama student Michael Mather, and a very nice opening from Giselle Wolf, a singer who spends much of her time in New York. We were also treated to the talents of Mayto Poyato, Steven Cree, Giles Terera and Steven Colburn, but the pièce de résistance came with Rachel Tucker closing the evening with a truly superb and unique rendition of Cabaret – what else? The style and rapport between Caruso and Stritch created an evening of merry banter and off the cuff wit, combined with a warmth and generosity that made everyone, including the audience, feel very much at home. I was also delighted to be able to sing a song from my own show Wartime Women: the Khaki Cabaret. Set to music by Handel, it was a comic song about an 18th century female Marine called Hannah Snell – not a piece I would dare take to many open-mics, as it is fiendishly difficult for the pianist to sight-read. I was confident, though, that Billy Stritch would manage it, and he did not let me down. I know I am not alone in the community of singers in hoping very much these two return soon. This entry was posted in Features - Theatre and Cabaret News and tagged Billy Stritch, Cast Party, fiona jane weston, Jim Caruso, Marilyn Maye, Michael Feinstein. Bookmark the permalink.